The costs associated with replacing and upgrading older pumps in vintage power plants and process facilities have often been an obstacle for life extension programs or service change projects such as going for low sulfur fuel oils. However, when regulatory and operational demands make new construction hard to economically justify, it may be the only way to go. When analyzing the total costs for upgrading and/or renewing pump installations, the pump component itself is not the roadblock but merely the modification of piping and foundations including installation and commissioning. These costs have shown a significant increase due to absence of skilled labor and the necessity to rely on third-party installation and service contractors. 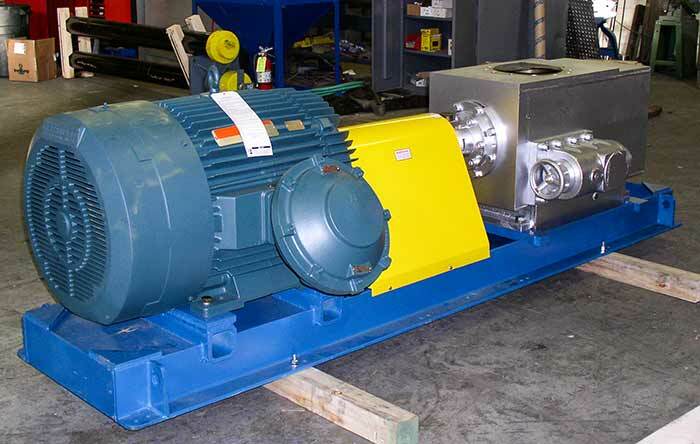 It is especially challenging when the original pump is no longer available and replacement parts become excessively expensive with long lead times. The original manufacturer could have ceased production of a certain model and replaced it with a new one that does not fit the existing footprint. Also, the manufacturer could have been acquired or reorganized and nobody knows how to trace the original pump. This article will focus on re-engineered pumps, which are not the same as re-manufactured pumps. A re-engineered pump is a newly built pump. A re-manufactured pump is an older pump that has been upgraded, modified or repaired to extend its service life or for a modified service. A re-engineered pump is custom-built in order to avoid modifying the existing installation configuration. Instead, the original pump suction and discharge pipe location, with insulation and instrumentation including the original electric motor and mounting, is kept. It will closely fit the envelope of the original pump including pump base, nozzles and drive shaft, which also help to keep the installation time to a minimum. As a result, the re-engineered pump will lower the total costs of replacing or upgrading a pump and positively impact the lead time in a pump replacement project. The most commonly re-engineered pump is the three-screw pump. It belongs to the positive displacement (PD) pump family and is known for its good suction lift along with handling viscous liquids and for low pulsations, noise and vibration. The pump flow rate is directly proportional to the speed and can be controlled using a variable speed drive (VSD), which is often a good way to reduce power demand as flow requirements vary. With internal hydraulic rotor balancing, the thrust load is compensated without using thrust bearings or thrust plates. Used with lubricant, fuel or hydraulic oils, the service life of these pumps is very long when operating at high pressure. It is a self-priming design, which can tolerate oils with air entrainment without risking flow loss and vapor locking. The design is simple with few moving parts and therefore easy to operate and maintain. Re-engineered pumps are built around a standard pump element, called a cartridge, which is installed in a fabricated external pump casing. The cartridge is sized for the actual hydraulic data of the installation and separately tested to these conditions in the factory. The casing, mostly made in fabricated steel, allows for almost infinite variations of nozzle locations and location of the mounting feet. 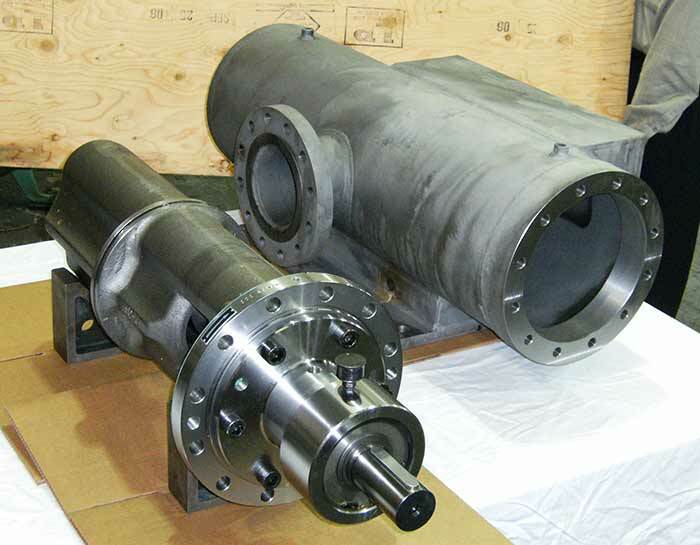 The casing designer, who is assisted by a computer-aided design (CAD) system, can import dimensions and configurations of the existing pump and apply these to a new design, resulting in a customized casing to fit the old installation. The casing can also be equipped with a pressure relief valve as shown in Image 3, which is an advantage when the old installation had a separate relief valve. Providing a relief valve integral to the pump can prevent expensive piping modifications if its function is questionable or if the operating data has been modified. There are many opportunities to use re-engineered pumps in power plants. Typically tied to mineral oil transfer or pressure boosting, examples from the past include fuel oil transfer and injection for boilers and gas turbines, hydraulic governor oil for steam and water turbines and—most frequently—as lubrication oil pumps for engines, reduction gears and other rotating machinery. The original pump can be another PD pump like a gear, vane or screw pump. However, centrifugal pumps have also been replaced when changes in the fluid characteristics like viscosity changes or air entrainment are outside the operating window of the centrifugal pump. The liquids that the re-engineered pumps handle include fuel oils from distillate to No. 6, lube and hydraulic oils and, in some cases, palm oil and water-based hydraulic fluids.